Residential waste services are our specialty. 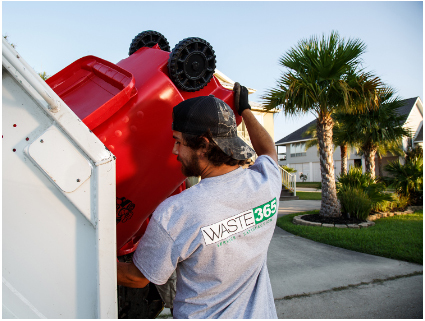 WASTE 365 provides weekly trash collection across the Northshore in Louisiana to the communities of Slidell, Mandeville, Covington, Abita Springs, Talisheek, Lacombe, and Pearl River. WASTE 365 has the resources needed to provide dependable waste pickup services throughout St. Tammany Parish and in your neighborhood. WASTE 365 promises consistency, and peace of mind as a result of a commitment to providing you with timely and consistent waste pickup. There are a myriad of user-friendly online customer tools to help you manage your account and pay bills, as well as quick and accurate answers from knowledgeable customer service representatives either online or by telephone. WASTE 365 takes pride in the St. Tammany community and it is the wish of the company to treat our clients like our neighbors. Trash is collected curbside every week. Contact Customer Service at CustomerService@waste365.net or call us at 985-466-1765. Is your pick-up is on a holiday? Which items belong and which do not. When and where to put your garbage. WASTE 365 provides contracts for residential pick up for Homeowner Associations (HOAs) and Subdivisions. It would be our pleasure to service your residential community. If you would like more information, please contact customerservice@waste365.net or call us at 985-466-1765.